This PosSizer allocates capital relative to the number of trade candidates, separately for long and short signals, according to a set of rules. The capital is broken in two equity pools - specifically for long and short positions. Then, depending on the number of Alerts in each group, the size is equalized by dividing an equity pool by a number of maximum allowed positions (up to 2 rules can be defined per each "equity pool"). For example, if there are three long candidates, and the long equity pool for max. 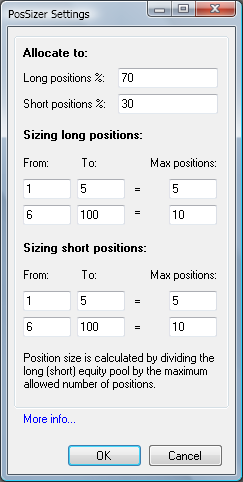 5 long positions is 70%, then each long position will be sized at 14% (70% / 5), totalling 42% in long positions (14% * 3 = 42%).